HCM CITY (VNS)— For the first time in the season, Becamex Binh Duong emphasised their title credentials by delivering a crushing 5-2 defeat on Vissai Ninh Binh in a ninth round V-League 2014 match at the Binh Duong Stadium. The victory, Binh Duong's fourth win in their last five matches, helped the two-time champions climb up to second place on the rankings table with 14 points, eight behind current leaders Thanh Hoa. Huynh Kesley and Abass Cheik Dieng each grabbed a brace while Suleiman Abdullahi scored the other one, all in the second half. 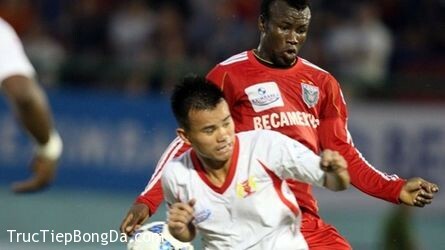 Hoang Danh Ngoc and Le Quang Hung each scored one goal in each half for Ninh Binh. Despite playing at home and seen as pre-match favourites, the final score was still a surprise for home fans, especially after the display put on by the visitors in the first half. The visitors began the match confidently and created two chances within the first few minutes. Jamaican striker Kavin Bryan headed the first over the crossbar in the fourth minute and struck the other straight into the hands of host custodian Nguyen Quoc Thien Else a minute later. This set the tone for coach Nguyen Van Sy's team to open the scoring and the goal came from Ngoc, who sprinted forward on the right wing to head home a cross-field, long pass from the left. The home team fought back strongly and created their own chances but they all went abegging, Dieng being the culprit in each case. Meanwhile, Ninh Binh frequently threatened with their counter-attacks, and striker Le Van Thang fluffed an easy chance. Binh Duong could have had the equaliser before half-time if attacking midfielder Nguyen Trong Hoang and Dieng were more accurate in one-to-one face-offs with keeper Nguyen Van Hung. However, the home team's strikers made amends in the second half, delighting their fans with as many as five goals. Huynh Kesley opened the floodgates, scraping home a low shot past Hung after showing good footwork to beat two Ninh Binh defenders. The visitors responded immediately with a quick goal from Hung, who was let free by Bryan and went on to shrug off a defending challenge to restore the lead. But this score lasted only two minutes before Hoang Van Binh collected a rebound and floated it into the box. Dieng fled into box and put the ball past Hung to make it 2-2. Suleiman Abdullahi headed home a corner on the left to put the home team ahead for the first time in the match. Binh Duong's coach and his staff were freed from all worries when Kesley converted a penalty in the 65th minute to establish a two-goal lead. Chu Ngoc Anh used his hand to clear Hoang's cross, and was spotted by the lineman.